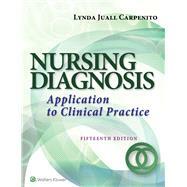 Prepare your students to effectively apply nursing diagnosis to clinical practice. A comprehensive A-to-Z guide to current nursing diagnoses includes the most recent diagnoses approved by NANDA International. Nursing Interventions Classifications (NIC) and Nursing Outcomes Classifications (NOC) are listed for every NANDA-I diagnosis; NANDA-I diagnoses have been updated. Author's Notes and Errors in Diagnostic Statements help students understand the concept behind the diagnosis, differentiate one diagnosis from another, and avoid diagnostic errors. “Carp’s Cues” appear throughout and consist of notes from the author to emphasize a certain principle of care, a controversial issue, or an ethical challenge. Key Concepts and Interventions are grouped by specific population--older adult, child, maternal, and transcultural--to help clarify the differences between the client groups. Section 3: Manual of Collaborative Problems shows how to integrate nursing care and diagnosis with the efforts of other healthcare professionals for optimum care of the client. A Nursing Diagnosis Index provides an at-a-glance, alphabetical reference that makes finding diagnoses quick and easy.